FAA regulations, Title 14 Code of Federal Regulations section 91.207(d)(4), requires that an aircraft emergency locator transmitter (ELT) be tested annually for 'the presence of a sufficient signal radiated from its antenna.' The Aeronautical Information Manual (AIM) in Chapter 6, Section 6-2-5, discusses ELTs, their use, and how to test them. To paraphrase a statement from a movie about a failed trip to the Moon, 'Folks, we have a problem.' The FAA requires an ELT radiated test, but if the test is not done properly, the Federal Communications Commission (FCC) might take enforcement action against the person doing a 406 MHz ELT test. Here is the problem. When the FAA test requirements were written, the basic ELT was an analog 121.5MHz unit transmitting in the aeronautical frequency band. If the ELT being tested could not be isolated within an approved radio frequency shielded room or container, which keeps the signal from going beyond the room or container, a radiated test could be done within the first five minutes after the hour. The test requirements listed the number of recommended sweeps of the signal to minimize the risk of anyone thinking the test signal was an actual distress alert. The person doing the test would quickly activate the ELT, listen for its distinctive sound on a nearby aeronautical band aircraft radio or hand held transceiver and then turn off the ELT. This test method met the FAA requirement and most organizations were okay with the idea. 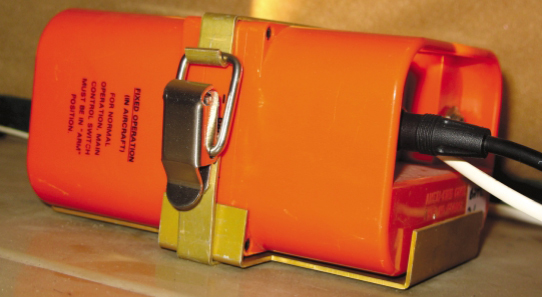 That was until the newer 406 MHz ELT distress beacon was developed. Part of the problem is that instead of being in the aeronautical band, 406 MHz is a protected international distress frequency. Plus, with a properly registered 406MHz ELT, the transmitted signal includes a digital code that can be used to identify the owner. As a result, the FCC can track down anyone who, in its opinion, transmits a fraudulent or non-emergency distress signal, e.g. an FAA test. Since most 406 MHz ELTs include a low-powered 121.5 MHz homing transmitter, the challenge for the person doing the annual ELT check is how to satisfy the FAA requirement without violating the FCC regulations. Since in most cases the person doing the testing has no way to monitor the406 MHz emitted coded signal with-out special equipment and can there-fore only listen for the activation of the121.5 MHz homing signal of the combined 406/121.5 MHz ELT. Short of a change in the regulation, the following is one means of conducting the test. Remember, the purpose of test is to check the aircraft's installed system from ELT transmitter to its antenna. Anyone testing any ELT should follow the manufacturer's recommended procedures. If those procedures are not available and cannot be found, the following is one procedure that has been coordinated with the National Oceanic and Atmospheric Administration (NOAA) which operates the United States portion of the inter-national satellite-based search and rescue system that monitors and processes distress beacon alerts. Owners of 406 MHz ELTs should limit any test to less than 30 seconds. This will preclude the satellites from receiving a signal from the 406 MHz beacon when activated to the 'ON' condition or switch position while testing the 121.5 MHz ELT portion of a combined ELT. This will prevent the government from initiating a search and rescue action. There have been numerous reports of unintentional activation of the combined ELTs when periodic maintenance testing of the 121.5MHz signal is tested to assure proper performance. Activating the 'ON' function, which is part of the remote control panel rather than gaining access to the combined ELT and activating the 'TEST' function, has led to violations administered from the FCC and causes emergency responders to react in an attempt to locate a downed air craft. If the selection to the 'ON' position is minimized to 30seconds or less, there is sufficient time protection to prevent crossing the 50-second time threshold for activating the 406MHz locator signal. Operators should advise their maintenance personnel of this limitation and possible vulnerability to violations or sanctions. 1. ELTs should be tested in accordance with the manufacturer's instructions. This should be done, preferably, in a shielded or screened room or specially designed test container to prevent the broadcast of signals, which could trigger a false alert. (a) Analog 121.5/243 MHz ELTs should only be tested during the first five minutes after any hour. If operational tests must be made outside of this period, they should be coordinated with the nearest FAA Control Tower or Flight Ser-vice Station. Tests should be no longer than three audible weeps. If the antenna is removable, a dummy load should be substituted during test procedures. (b) Digital 406 MHz ELTs should only be tested in accordance with the unit's manufacturer's instructions. (c) Airborne tests are not authorized. 1. Caution should be exercised to prevent the inadvertent activation of ELTs in the air or while they are being handled on the ground. Accidental or unauthorized activation will generate an emergency signal that cannot be distinguished from the real thing, leading to expensive and frustrating searches. A false ELT signal could also interfere with genuine emergency transmissions and hinder or prevent the timely location of crash sites. Frequent false alarms could also result in complacency and de-crease the vigorous reaction that must be attached to all ELT signals. (d) When maintenance is being per-formed near the ELT. (f) If an ELT signal is heard, turn off the aircraft's ELT to determine if it is transmitting. If it has been activated, maintenance might be required before the unit is returned to the 'ARMED' position. You should contact the nearest Air Traffic facility and notify it of the inadvertent activation. (d) Your flight altitudes and frequency on which the emergency signal was heard: 121.5 MHz or 243.0 MHz. If possible, positions should be given relative to a navigation aid. If the aircraft has homing equipment, provide the bearing to the emergency signal with each re-ported position.